The new ‘YoPRO’ contains 15g of protein per serving, no added sugar, no artificial sweeteners and less than 0.5 per cent fat. A traditional straining method is used to create a thick yoghurt which is high in protein. In total, more than three cups of milk must be strained to create one cup of YoPRO. General Manager of Danone Murray Goulburn Australia, Francois Rillet, said YoPRO targets active millennials who do not usually eat yoghurt. 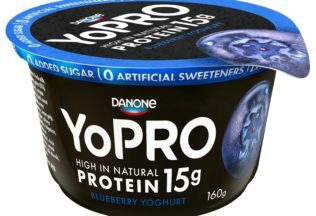 ’YoPRO has a great potential in Australia, with really unique macronutrients – 15g protein, no added sugar, no artificial sweeteners and less than 0.5% fat,” Rillet said. YoPRO is available in plain, vanilla, strawberry, passionfruit, mango and blueberry flavours. It is available now in 160g cups at Woolworths, Coles and IGA supermarkets. AmazonFresh to be scaled back in the U.S.